McMillan has released a new semi-auto tactical rifle, based on a Springfield Armory M1A receiver, glass-bedded by hand. McMillan’s new M3A rifle is configured for scope use, and features a CNC-inletted McMillan stock with adjustable cheekpiece. The gun takes M1A/M14 magazines. The M3A features a 6-groove, 10-twist, 18″ barrel, chambered in .308 Winchester. A notable option is a massive three-sided rail system. This allows the user to fit a scope very securely in either standard or front (scout scope) position. The side rails can carry other accessories such as lights or a back up red-dot scope. The trigger is a two-stage with pull weight of 5-6 pounds. Shown below is the M3A with optional full-length upper handguard tactical rail. CLICK HERE for more information, or call (623) 582-9674 for pricing with desired options. A variety of McMillan rifles are showcased in the Video below. 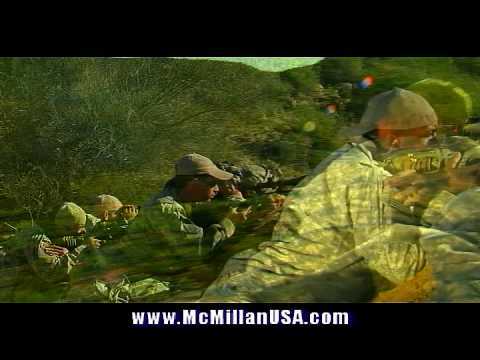 Share the post "New McMillan M3A Tactical Rifle"